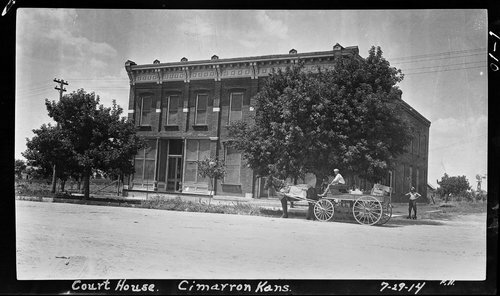 This two-story brick commercial building located at 117 S. Main in downtown Cimarron was at the center of a heated county seat dispute in 1889. When Gray County was established in 1887, Cimarron was designated the temporary county seat. Nearby Ingalls also sought permanent county seat status and in an election on October 31, 1887, both towns claimed victory. Accusations of buying votes and ballotbox stuffing were slung back and forth. The Kansas Supreme Court eventually declared Cimarron the winner. This building served as Gray County's first courthouse and was one of only a few permanent masonry buildings in Cimarron at the time. The county leased the building in January of 1888. One year later, a group of men from Ingalls raided the courthouse and stole the county records leaving three men dead in the bloody gunfight. Despite this setback, the county continued to operate in Cimarron. The present courthouse, which dates to 1927, is located two blocks south of this building. This building is listed on the National Register of Historic Places.